Tyr-Pwll Holiday Cottages01873 850457work Self-cateringWe have one Self catering cottage which was a former farm building. We have one Self catering cottage which was a former farm building. Swallow's Nest cottage has one double bedroom, a large lounge, which has a sofa bed, fitted kitchen and bathroom, and also has lovely views from the front of the cottage. We can be found just 2 miles from Abergavenny town, on th B4598 old Abergavenny to Usk road. Full directions can be found on the website. 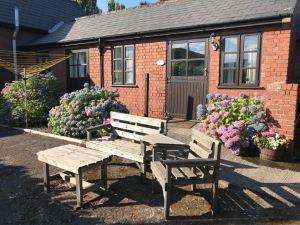 The cottages are on the main bus route between Abergavenny, Raglan, Monmouth. We are just a hundred yards or so from the B4598 road. Our good concrete driveway leads to ample parking spaces for holiday makers, and handrails are provided on the slope leading to The Swallow's Nest cottage.